The Tricorder is an all-purpose hand-held scanner, capable of detecting and locating a wide variety of scientific phenomenon. A multipurpose scientific and technical instrument, the Tricorder was developed by Starfleet and incorporates sensors, computers, and recorders in a convenient portable form. The current generation tricorder incorporates built in expansion bays containing specialized scanning peripherals in one unit - merging the functions of four specialized units into one Tricorder. Coming into service in 2425, the Tricorder TR-600 is the latest generation of Tricorder to be developed by Starfleet Research and Development and incorporates all functions of specialized Tricorders previously utilized in this single unit due to technological advancement. Unlike most previous versions of the Tricorder unit, the TR-600 is a handsfree unit and is worn by its user on his or her forearm similar to a 21st Century Smartwatch on Earth. While the unit is traditionally operated in its wrist mounted format, the unit can be disconnected from the wrist straps for hand held use if needed. Constructed out of a lightweight Polyduranium alloy and designed for durability, the TR-600 can operate in a wide variety of environments (including underwater and even in a Class Y environment) and traces its design back to two tricorders utilized in the mid-24th Century: the TR-590 XI and the Modified Diplomatic Tricorder utilized by cultural survey teams. The computational ability of the TR-600 is provided by an integrated Positronic Chip. In its base form the Tricorder is capable of almost 60 trillion operations per second - approximately the same as a Soong-Type Android. The TR-600 has abandoned traditional physical controls and replaced them with a touch sensitive display and it is powered by a traditional Sarium krellide battery that has been rated for 72 hours of continuous usage before recharge. Despite its small size the TR-600 has been equipped with 600 separate sensors capable of performing a wide variety of scans and can be set for both active and passive scanning modes in order to minimize the risk of detection by hostile forces. Due to built in universal translator software the TR-600 is able to interface with alien computer systems. One unique advantage of the TR-600 over previous models is that, in its wearable configuration, the unit maintains constant contact with the Missions Operations Workstation aboard a Starship or Starbase allowing for remote access of the data acquired by the TR-600 so long as the unit was within 75,000 kilometers of its mothership's computer systems. 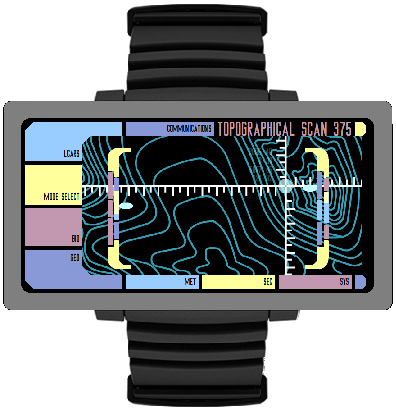 The TR-600 also completes detailed scans of the user while on assignment and automatically transmits the data to Sickbay for monitoring of the user.